There are a whole bunch of articles outlining the talent gap in security related positions. More and more jobs require IT skills and IT systems are more and more integrated in all areas of our life with an dramatic increase of open positions in security and privacy. People living in areas like SF / silicon valley, New York or Zurich can find easily new jobs within days, but those locations are also very expensive and some companies can not hire there. 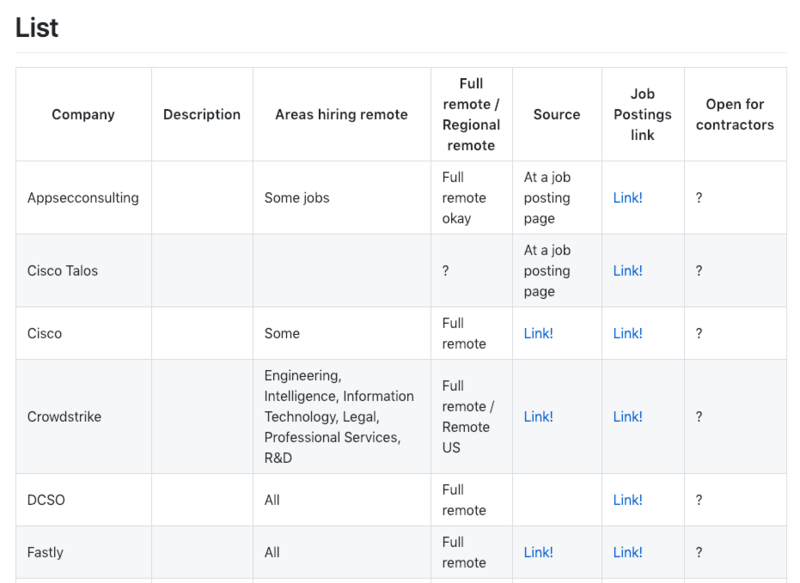 This post is not to outline the benefits of shortcomings of working / hiring remote but the fact that it is very hard for candidates to find companies welcoming remote security minded people. On the other side, companies have a hard job, market themselves against the big brands to attract remote people. That combined is the reason I created yet another list on github, called companies-hiring-security-remote. It is a curated list and open for issues / pull requests to act as a platform for job seeking people and companies to give them a little more visibility. I really hope that this will help people and I am happy to receive feedback. Dieser Eintrag wurde veröffentlicht in Allgemein und verschlagwortet mit cyber, jobs von Alex. Permanenter Link zum Eintrag.